The Wilson Clash technologies introduce a new level of racquet design, comfort, and performance. Free Flex - a special carbon mapped weave to permit the frame to flex along it's length for comfort and touch; it also has very high twist stability for control. Initially the racquet has a very soft flex and a touchy feel; but for harder hits, it feels to stiffen a bit to support the hard shot. Stable Smart - a computer designed yoke shape and cross-sectional geometry to provide very high yoke stiffness (which is very important to resist twist) which also supports the high longitudinal flex of the Free Flex technology. Previously, flexible frames uncontrollably flexed in all directions giving a mushy feel with lower spin and poor control. These Clash Technologies let the racquet flex lengthwise to give great feel and comfort; and provide a stiff flex in the twist dimension for true control. Countervail is a thin layer of visco-elastic polymer that is bonded to the graphite of the racquet to dramatically reduce vibration and increase comfort. Spin Effect is a patented Wilson technology that greatly increases spin for the player with normal flat strokes. For the modern aggressive game. Effectively lengthens the court by a foot and lowers the net by 2 inches; you hard shots will stay in and with spin will be harder to return. 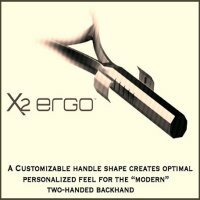 Patent-pending X2 Ergo Handle provides for an optimal, personalized feel on two-handed backhands. Nearly 80 percent of modern tennis players play a two-handed backhand, and for competitive juniors that number climbs to nearly 90 percent, yet modern rackets haven't evolved to accommodate this change. Wilson Labs developed a player-directed handle insert system that allows every player to customize an ergonomic handle shape to optimize their grip. The X2 Ergo Handle provides the ideal form for the top hand to dominate the modern two-handed backhand. This gives players more power, versatility, leverage, and feel. 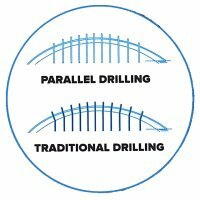 Parallel Drilling provides a consistent more forgiving sweet spot response while increasing the sweet spot. Because the main strings don't have bends, they are less prone to breaking on miss-hits. AmpliFeel is a proprietary Wilson handle technology that provides a clean and enhanced racquet feel. It works, AmpliFeel racquets feel more comfortable and have a noticeably nicer ball fee. Braided Graphite and BLX Fiber is an improvement to the original BLX technology to better combine the strength of the carbon fiber and the flexibility of Basalt. Wilson could have called this technology BLX 2. Basalt fiber is a material made from extremely fine fibers of basalt volcanic rock. It is similar to carbon fiber and fiberglass but has better physical-mechanical properties than fiberglass, it is more flexible, and is significantly cheaper than carbon fiber. In tennis racquets, this means a lighter material with a more controlled flex. This permits design of a more stable, comfortable playing head with no change in weight or balance. Wilson's nCode technology alters the molecular structure of carbon fiber by filling micro-voids with special nano-sized silicone oxide crystals. This prevents the fibers from moving around - at the molecular level. The result to you as a player is that the head of the racquet is more stable; it has much less flex and distortion when you hit the ball. This gives you more control, a bigger sweet spot, and a clean crisp feel when you strike the ball. 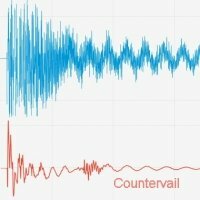 This is not just advertising hype; it really does work. We have play tested several identically strung nCode and non-nCode frames (the Triad 5 vs. the n5, the H6 vs. the n6, the Hammer tour vs. the nTour) and it really does work. The nCode racquets all had a bigger sweet spot and a crisper, more controlled feel. In addition, the racquets last longer. All carbon fiber racquets - from all manufacturers - last only so long before the fibers wear out and the racquet looses it's feel. For hard players this can be a season, for average players it can be several years; but they do wear out. Wilson says that on stress test machines, the nCode racquets kept their playability twice as long. 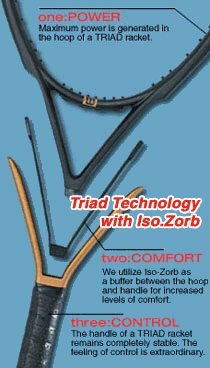 The iso-zorb strip adsorbs shock and vibration which make the racquet very comfortable to play with. Since the racquet has this shock adsorption, Wilson can also make the head area stiffer for greater control. Wilson is continually improving the design of the iso-zorb construction. Now in it's fourth generation, it has increased feel with amazing comfort. The iso-zorb material is an exclusive Wilson design. Triad racquets were first introduced in 2000, over the past years we have never encountered any construction or longevity problems. Wilson's Hammer technology is basically a racquet that overall is light but is also head heavy. The light racquet is maneuverable. The heavy head provides power and stability on shots. "Hammer" is a very effective and popular technology.